What really sets humankind apart from other species is our fondness of drugs. This vale of tears, full of plants and animals to tame, was the breeding ground for cultures and civilizations with a penchant for developing the noble art of pharmacy. The Neolithic revolution marked the coming into being and development of great states and empires, with the consequential increase in headaches. But that was no big deal, since shamans, witch doctors, physicians, priests, apothecaries and/or sorcerers sought, and sometimes found, remedies to relieve migraines and a wide range of ailments. 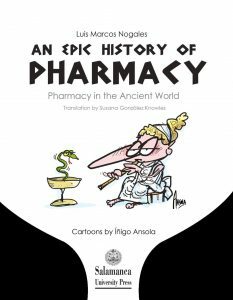 After a taste of this Epic History of Pharmacy you’ll doubtlessly feel better. You are holding a fully legal dose for a relaxing but at the same time frenzied trip: from the wild prehistoric Eden garden to the marmoreal and massive Rome, going through Mesopotamia, Egypt, India, China, America, Persia and Greece. And all of it visually administered, in the form of a carefully formulated ointment of literary panacea seasoned with humour-coated pills of compressed cartoons.